Everyday Spiritual Practices from Yoga and Ayurveda draws from yogic philosophy and foundations to invite you to bring conscious spiritual practices into your life. 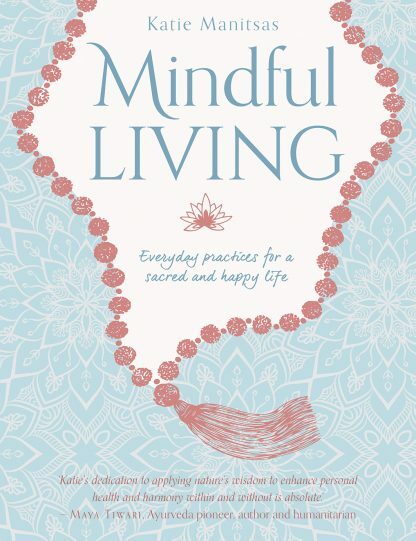 In this heartfelt and inspiring book, author Katie Manitsas shares sacred practices to help cultivate a spiritual life focused on meditation, intention setting, prayer and chanting, and daily rhythms to soothe the soul. She also provides routines for honoring the energy body, working with the elements, and eating food with kindness. Even adopting just one or two of the practices will create lasting change in your life and deeply transform the state of your soul. Everyday Spiritual Practices offers tools for growth and reformation that will allow you to experience deeper self-confidence and a powerful intuition arising in your life. Katie Manitsas is an advanced level Jivamukti Yoga teacher and a Wise Earth Ayurveda master teacher. She is also qualified in Kundalini Yoga and as a doula and holds the highest possible accreditations with Yoga Alliance and Yoga Australia. She has been teaching yoga for over 20 years, and her passions are yogic philosophy and the seasonal practices of sadhana, bringing devotion and a sense of the sacred to everyday life, and compassion for animals and a deep reverence for nature. Katie is the author of several books, including The Yoga of Birth. She is the mother of four young boys and lives with her loud and busy family in Sydney�s Inner West.